Figure 1. 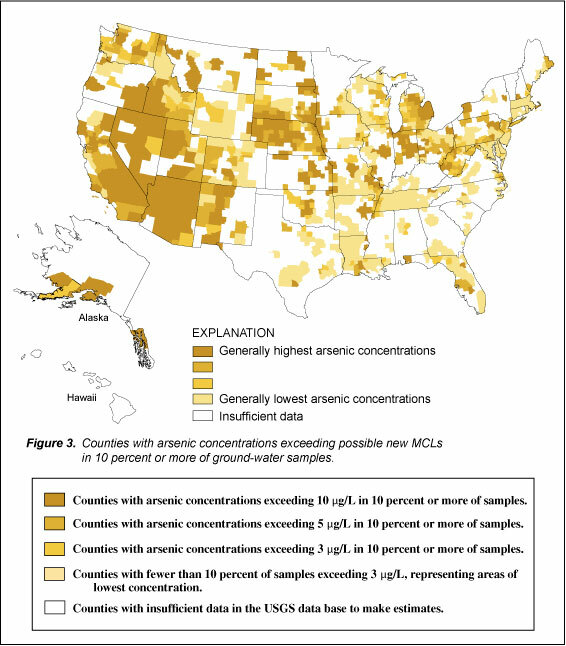 Arsenic concentrations in ground water of the United States. The U.S. Geological Survey (USGS) has collected and analyzed arsenic in potable (drinkable) water from 18,850 wells in 595 counties across the United States during the past two decades. These wells are used for irrigation, industrial purposes, and research, as well as for public and private water supply. Arsenic concentrations in samples from these wells are similar to those found in nearby public supplies (see Focazio and others, 1999). The large number of samples, broad geographic coverage, and consistency of methods produce a more accurate and detailed picture of arsenic concentrations than provided by any previous studies. Arsenic concentrations in ground water generally are highest in the West. Parts of the Midwest and Northeast also have arsenic concentrations that exceed 10 µg/L, the World Health Organization's (WHO) provisional guideline for arsenic in drinking water (World Health Organization, 1999). Arsenic concentrations appear to be lower in the Southeast, based on a smaller amount of data. Arsenic concentrations also could be high at locations not shown on figure 1 because data are not available everywhere. Even at sampled locations, concentrations might differ between shallow and deep waters. Nonetheless, these data illustrate how arsenic concentrations vary across broad regions of the country. To look at the Nation as a whole, arsenic data were grouped by county and linked to the number of public-supply systems withdrawing ground water in each county (Focazio and others, 1999). Estimates of the percentage of small public water-supply systems which exceed six targeted arsenic concentrations in their ground-water resource are shown in figure 2. Systems were called "small" if they served between 1,000 and 10,000 persons. Focazio and others (1999) provide similar information for both smaller and larger sized systems. The highest concentration evaluated is at the current MCL of 50 µg/L, along with several lower concentrations, one of which may become the new MCL. Figure 2. Percentage of small public water-supply systems estimated to exceed targeted arsenic concentrations in their ground-water resource (ug/L, micrograms per liter). As the concentration for a possible new MCL decreases, the likelihood of exceeding that standard increases. Just over 13 percent of systems used water with arsenic concentrations greater than 5 µg/L, compared to fewer than 1 percent exceeding the current 50 µg/L MCL. Public systems exceeding a new, lower MCL will be required to either treat their water or find alternative sources of supply. This choice undoubtedly will increase costs for consumers while decreasing their exposure to arsenic. Although homeowners with private wells are not regulated, a lower drinking-water standard would mean that more homeowners will be consuming water with concentrations that exceed a standard. 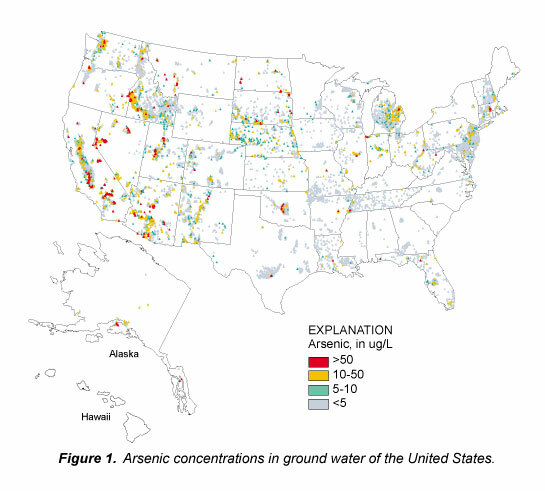 USGS information provides a broad picture of arsenic concentrations in ground water throughout the United States. In 24 percent of the U.S. counties where data were available, at least 10 percent of samples had arsenic concentrations exceeding 10 µg/L, the WHO provisional guideline for arsenic. Water users in these counties (colored darkest brown in figure 3) are the most likely to have ground water exceeding new standards for arsenic. Figure 3. Counties with arsenic concentrations exceeding possible new MCLs in 10 percent or more of ground-water samples. Focazio, M.J., Welch, A.H., Watkins, S.A., Helsel, D.R., and Horn, M.A., 1999, A retrospective analysis on the occurrence of arsenic in ground-water resources of the United States and limitations in drinking-water-supply characterizations: U.S. Geological Survey Water-Resources Investigations Report 99-4279, 21 p.
Welch, A.H., Westjohn, D.B., Helsel, D.R., and Wanty, R.B., 2000, Arsenic in ground water of the United States--Occurrence and geochemistry: Ground Water, v. 38, no. 4, July/August 2000, p. 589-604. Return to report main page.